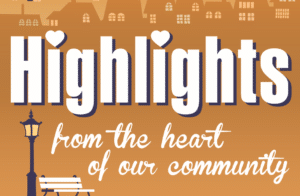 The show airing July 2, 2018 – July 9, 2018 ‘highlights’ the UC School of Pharmacy and Kanawha Communities That Care. We interviewed Susan Bissett, Ph.D., Assistant Dean for Professional and Student Affairs & Assistant Professor at the University of Charleston School of Pharmacy, and Steve Burton, Executive Director of Kanawha Communities That Care. Steve discussed the purpose of KCTC. They work daily to increase awareness of the substance abuse-related problems and issues facing the youth and adults of Kanawha County, and to lead a long-term, dynamic community-wide effort to create a safe and healthy environment for all of our citizens, especially youth, through the development and maintenance of strong interventions that focus on the youth citizens and use scientific, research-based programs and services with measurable outcomes. The two organizations recently collaborated on a grant project. The University of Charleston School of Pharmacy’s (UCSOP) proposal, West Virginia Partnership for Generation Rx Expansion & Statewide Media Campaign, has been selected as a 2018 Cardinal Health Foundation’s Generation Rx Prescription Drug Misuse Prevention Education for Youth Program grantee and approved for funding in the amount of $35,500.00. The University of Charleston School of Pharmacy was one of more than 40 organizations across Ohio, Kentucky, Tennessee and West Virginia to receive a prevention education grant from the Cardinal Health Foundation. As part of Cardinal Health’s Opioid Action Program, the Prescription Drug Misuse Prevention Education for Youth grants are designed to expand medication safety education for thousands of students in K-12 schools and universities, using Generation Rx educational materials. Over the next year, each of the recipient organizations will engage students and parents in these interactive prevention education sessions, and meet regularly with each other in a learning collaborative to share their progress, lessons learned and best practices. Generation Rx is an evidence-based program developed in collaboration with the Cardinal Health Foundation, the American Pharmacists Association (APhA), and The Ohio State University School of Pharmacy. The Generation Rx curriculum is designed to increase public awareness of prescription medication abuse and medication safety. The program also encourages healthcare providers, community leaders, parents, teens, and college students to actively work to prevent abuse. 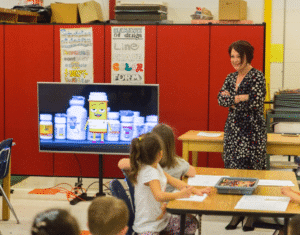 Since 2016, UCSOP has worked with Kanawha Communities that Care (KCTC) and Kanawha County Schools (KCS) to train more than 200 UCSOP student pharmacists to deliver the Generation Rx curriculum to more than 650 elementary-aged students on the issue of prescription medication use and abuse. The Generation Rx curriculum has a mascot, Rex the Rx. He is quite popular among the 3rd graders. Steve also mentioned their work in Upper Kanawha Valley as they partner with many like-minded organizations in that area. For more information about KCTC, call them at 304-437-3356. To reach the UC School of Pharmacy, contact them at 304-357-4889.